At a time when developing countries are struggling with safe disposal of compact fluorescent lamps (CFLs), Sri Lanka is leading by example. Pitipana, a small town 35 km from the capital Colombo, is home to South Asia’s first CFL recycling plant, Asia Recycling. The plant is owned by Orange Electric, which has a local market share of 48 per cent in CFLS. “We at Orange Electric manufacture around 0.6 million CFL bulbs every month. Almost 0.5 million of these are disposed in Sri Lanka every month. As a manufacturing company, we wanted to be responsible for safe recycling and treatment mechanism for CFL waste,” says B G Gunathilaka, operations manager, Asia Recycling. Operational since 2011, the state-of-the-art plant has the capacity to recycle up to 30 million CFLs annually—nearly three times more than the annual usage in Sri Lanka. The facility has been set up in partnership with Nordic Recycling AB of Sweden. The plant collects CFL waste from institutions such as banks, schools and universities, factories, hospitals and government agencies. Households are encouraged to dispose their CFL waste at designated collection centres. Orange Electric has put collection boxes at leading supermarkets and distributor points across the country. The company also entices consumers with monetary incentive. “We give a discount for any brand of CFL bulb that is returned to the vendor. If a person buys a new CFL bulb in exchange of an old and used bulb, s/he gets 10 Sri Lankan rupees (LKR) discount on the new bulb,” Gunathilaka says. 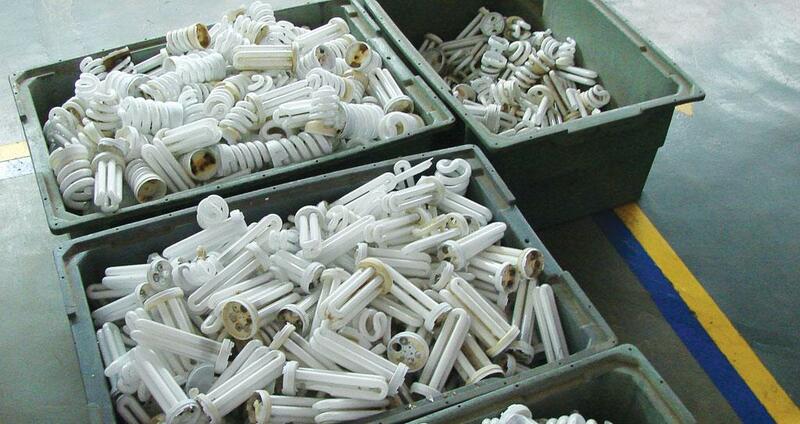 Once the CFLs are collected, they are assembled at the Pitipana plant for recycling. Fifteen people are involved in the recycling process. The components of a CFL are first separated manually. The CFL waste is then put inside the Mercury Recovery Technology (MRT) machine, which has been imported from Sweden. The machine breaks down this waste into plastic, metal and glass fractions. The glass containing mercury undergoes a second tumbling cycle (see ‘Bulb breakdown’). The extraction of mercury, the most toxic component in a CFL, is the last step. Gunathilaka says that mercury in CFLs nowadays is mostly contained in an amalgamated solid form mixed with phosphorous powder to keep it stable. The mercury extracted is stored in barrels at a temperature below 25° Celsius to prevent evaporation. 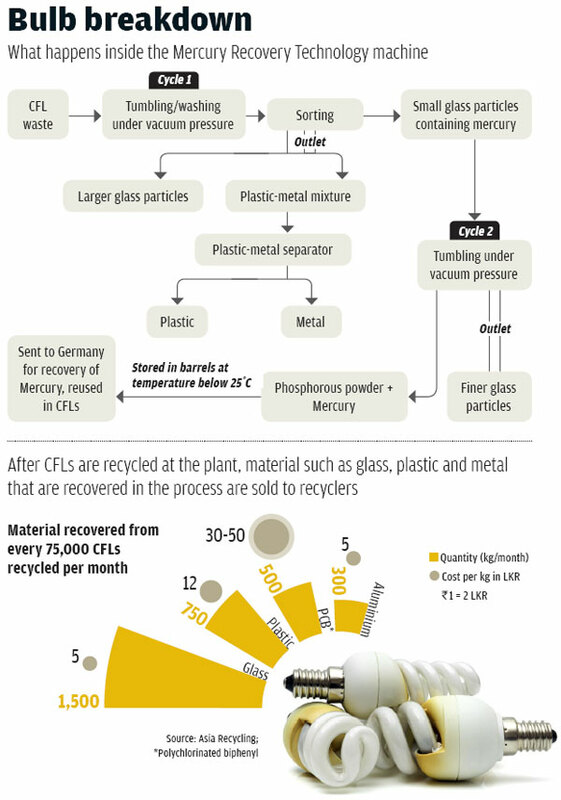 It is transported to Germany, the only country with the technology to recycle mercury, for reuse in new CFLs. The other material recovered in the process are sold to recyclers. On the measures to check mercury pollution in the plant, Gunathilaka says that the company maintains 0.1mg/m3 of mercury exposure limit, less than the 1.0 mg/m3 prescribed by the US Occupational Safety and Health Administration (OSHA). He adds that all workers have to adhere to safety norms and wear personal protective gear while entering the recycling premises. According to an official of the country’s Central Environmental Authority (CEA), no accidents have occurred in this facility so far. “We conduct periodic surveillances and audits to check the status of compliance to OSHA standard,” he adds. Awareness drives to sensitise people about CFL recycling has also not picked up. “We intend to conduct awareness programmes in the future with the help of CEA. We also need to strengthen the recycling sector to enable recycling of plastic, metals and glass, which is not happening on a large scale at the moment,” says Perera. He mentions that Asia Recycling is open to other CFL manufacturers in Sri Lanka who wish to recycle their CFL waste. “We charge LKR 10 per bulb from other companies to cover part of our operational cost since we are running the plant from our corporate social responsibility fund,” Perera adds. The government, however, has not come forward to support the recycling process at the plant. This is so important it needs to be made mandatory worldwide..